Book a Gourmet tour in Aix en Provence! You’ve heard about Provençal cooking, so here’s your chance to discover it first hand! This Gourmet tour begins on a Monday and ends on a Saturday. Your tour will begin with a transfer from the Aix en Provence TGV station or from the Marseille airport. You will check into your charming 3* hotel located in Aix en Provence city center. Dinner on your own and overnight the hotel. You’ll have breakfast at the hotel. Enjoy a morning walking gourmet tour in Aix en Provence with an English speaking chef. Stroll around the colorful stalls of the open air weekly market and sample provencal products directly with the producers (calissons, olives, cheese and seasonal fruits). 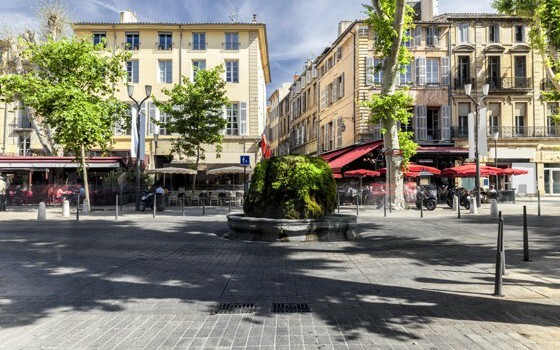 Walk with your guide on the Cours Mirabeau lined with 17th and 18th centuries private mansions, where large plane trees give shade on hot summer days. The old town is packed with shops, architectural and religious sites, bustling squares and refreshing fountains. In the afternoon, follow a short English guided tour of Cezanne’s studio. Aix is the birthplace of the painter Paul Cézanne. The studio was built from his own plans and time seems to stand still there! Dinner on your own and accommodation at the hotel. Join a minibus full day tour with English guide. Drive to Manosque to enjoy a guided tour of Occitane factory, famous for its cosmetic products elaborated with local flowers and plants. Cross Valensole plateau (lavender fields in bloom from mid June to mid July). Continue to Moustiers-Ste-Marie, famous for its earthenware workshops (free time for visit and lunch on your own). Drive to the Gorges of Verdon River with breathtaking views on the lake of Sainte Croix and on the Verdon canyon. Free time on the beach of the lake of Sainte Croix. Back to Aix en Provence via the village of Sainte Croix du Verdon overlooking the lake. Afternoon dedicated to the highlights of the Lubéron. Photo stop in Lourmarin, one of the most beautiful villages in France, famous for its Renaissance castle. Discover Bonnieux, a pretty village dominated by its perched Church. It seems to rule over the Combe of Lourmarin, a unique road through the Lubéron. Continue to Roussillon through the Pont Julien, a Roman bridge. Discovering Roussillon, you will marvel at a hilltop village famous for the ocher colors of its cliffs. After breakfast at your hotel, you will meet your English-speaking chef in her kitchen workshop located in the heart of historic Aix en Provence where a warm welcome awaits you. Enjoy a morning cooking class followed by lunch (drinks included). A family-like atmosphere helps to brIng out the aromas of home cooked meals. The proximity of the market ensures a daily supply of fresh produce and ingredients. The courses are organized in small groups with a maximum of 8 participants around a central island so that everyone can get in on the action in a relaxed and friendly atmosphere. Join a minibus shared half day tour driven by an English speaking guide for an unforgettable visit of Cassis! Free time in the charming fishermen port. Possibility to join a cruise to discover the calanques, limestone cliffs diving in the clear blue waters of the Mediterranean sea and creating natural coves (thick, rocky claws that resemble Norwegian fjords and poke out into the sea). Cruise ticket not included in tour price. There are some places you can’t help but fall in love with at first sight and Cassis is one of them ! Back to Aix en Provence. In the afternoon, private transfer from the hotel to Aix en Provence TGV station or Marseille airport.